Fancy Nancy’s little sister JoJo returns in her very own adventure! JoJo is helping Mommy and Daddy with the new twins. But they look the same! How will JoJo tell the twins apart? JoJo’s plan will keep you laughing. Beginning readers will love this My First I Can Read that is carefully crafted using basic language, word repetition, sight words, and charming illustrations. 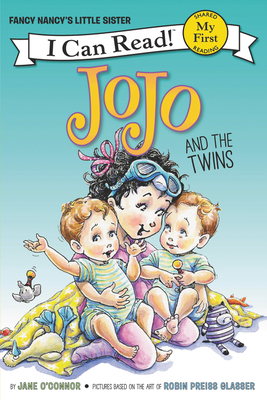 From the beloved New York Times bestselling author-illustrator team Jane O’Connor and Robin Preiss Glasser, Fancy Nancy: JoJo and the Twins is a My First I Can Read, perfect for shared reading with a child. Jane O’Connor is an editor at a major publishing house who has written more than seventy books for children, including the New York Times bestselling Fancy Nancy series. She resides (that’s fancy for lives) with her family in New York City. Robin Preiss Glasser actually wore tiaras and tutus when she danced with the Pennsylvania Ballet. Now she happily spends her days in jeans, drawing. She has illustrated many acclaimed picture books, including the bestselling Fancy Nancy series. She won the Children’s Choice Award for Best Illustrator of the Year for Fancy Nancy and the Mermaid Ballet. Robin and her family live in Southern California.